Why is a 43% Failure Rate in College Considered College-Prep? IDEA puts students on path to succeed in an increasingly competitive global marketplace by providing a rigorous college preparatory education and preparing our low-income, Hispanic and minority students in under-served communities across Texas to apply, matriculate and succeed in a the four year college or university of their choice. To date, 100% of IDEA graduates have been accepted to a four-year college or university and our student (sic) are demonstrating remarkable staying power: 92% are either still in college or have graduated. Yet, these claims are demonstrably false, the report fails to cite any data sources or studies that substantiate the claims, and the report fails to report publicly available data on the performance of students in four-year universities. The remainder of this short report substantiates my claims made about statements included in the IDEA annual report and provides data from the Texas Higher Education Coordinating Board about the Performance of IDEA Public School graduates in Texas four-year universities. While 100% of graduates from IDEA may ultimately enroll in four-year universities, data from the Texas Higher Education Coordinating Board (THECB) directly contradicts this claim for every cohort with available data. Table 1 shows the number and percentage of IDEA graduates in various settings in the fall immediately after high school graduation. Some students are not trackable due to issues in the student identification number and some students are designated as “not found.” Students not found could have entered a post-secondary institution in another state or simply not entered any post-secondary institution. As shown in Table 1, 58% of IDEA 2007 graduates entered a Texas four-year university while 75% of 2011 graduates entered a Texas four-year university. These rates could be greater if non-trackable and not found students actually entered four-year universities either within Texas or in another state. However, even if we assume that all non-trackable and not found students actually entered four-year universities, the rate would still not be 100% since between 6% and 11% of graduates entered two-year colleges. While the rate of students entering four-year universities is impressive, the rate is not 100%. Thus, data from THECB clearly contradicts the claims of IDEA CEO Tom Torkelson. * The data from 2008 through 2010 is based on the student GPA file while the 2011 data is based on enrollment data. There is a small difference in the calculations for each file, but the differences tend to be very small. 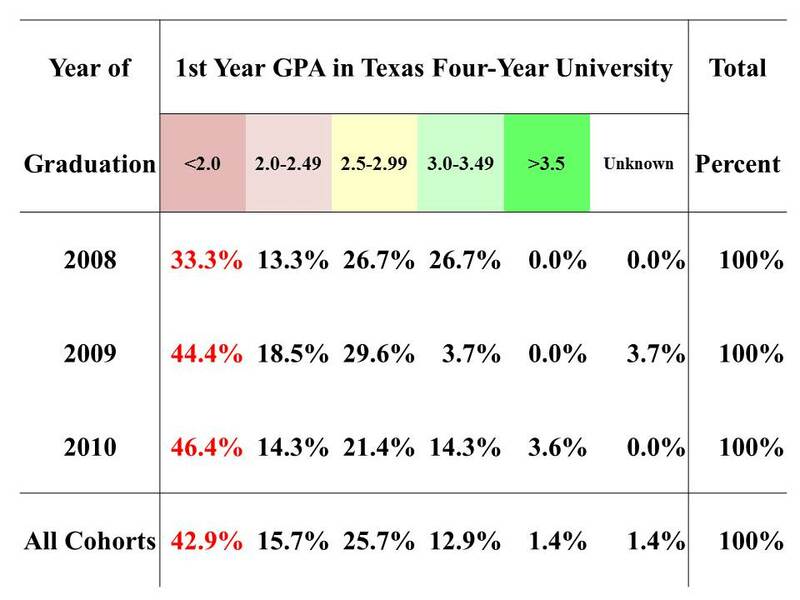 Missing Data Point #1) Nearly 50% of IDEA graduates in four-year universities in Texas earned less than a 2.0 GPA. While a high percentage of IDEA graduates enter Texas four-year universities, many of these students perform very poorly once enrolled. The THECB not only collects where high school graduates go after high school, the agency also calculates the first year GPA of students in two-year and four-year universities and makes the data publicly available on the THECB website. This data is collected slightly differently than the placement data used for the 2011 data in the previous analysis, but is quite similar. One major difference is that the GPA data is based on the results for a student over the fall, spring, and summer semesters following graduation rather than simply the fall semester following high school graduation. 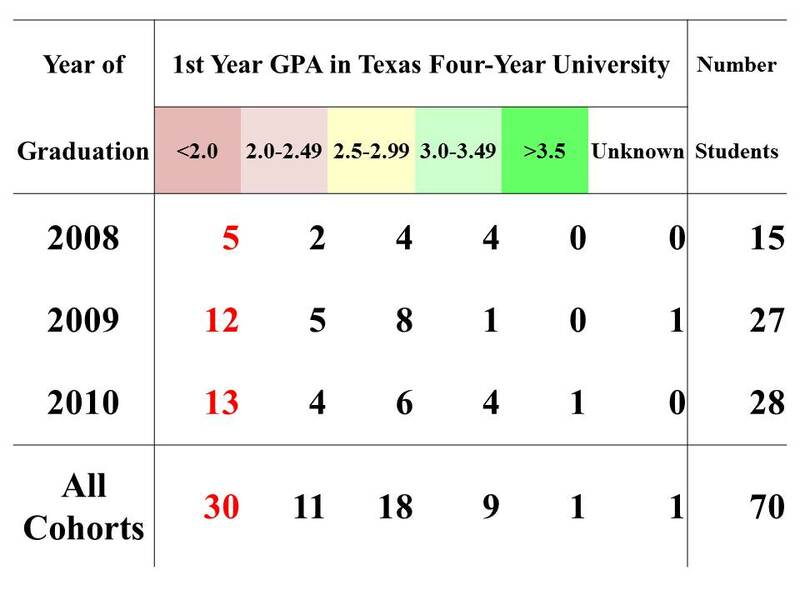 Table 2 documents the number of IDEA graduates who earned a GPA within selected ranges for the graduation cohorts of 2008, 2009, and 2010 while Table 3 provides the percentages of students within each GPA range. The data clearly shows that a substantial percentage of each graduating class earned below a 2.0 GPA. In fact, almost one out of every two graduates from the 2010 graduating class earned less than a 2.0. For the 2008 graduating class, the percentage was 33% while the percentage increased to 44% and 46% for the graduating classes of 2009 and 2010, respectively. Across all three cohorts, about 43% of graduates earned less than a 2.0 GPA. This is a substantial percentage of graduates and seems incongruous with the notion of being a college preparatory school. Further, the percentage of IDEA graduates earning lower than a 2.0 GPA has been increasing over time. Thus, rather than improving the college readiness of graduates, IDEA appears to be moving backwards in this area. One would think that given claims of the CEO, the marketing focus on being a college preparatory school, and the recent $29 million Race to the Top award from the US Department of Education, IDEA graduates would be showing improving performance in this area. Yet, this is not the case. In addition, this data calls into serious question the 92% persistence rate of IDEA graduates in universities as claimed in the IDEA annual report. While students earning less than a 2.0 GPA during the first year of college do not necessarily get removed from the university or drop out of school, the fact that nearly one out of every two IDEA graduates failed to earn a passing GPA suggests that more than 8% of IDEA graduates might fail to enroll after their first year of post-secondary work. Unfortunately, IDEA provides no data source or even data table to substantiate their claim about the persistence rate and, given that many of IDEA’s claims have proved to be untrue, one has to question the veracity of claims that are not substantiated by some independent data source. I have written about this issue before in more detail (see https://fullerlook.wordpress.com/2011/12/11/college-readiness-of-idea-and-other-high-schools-in-the-rio-grande-valley/) and shown that given the initial scores of IDEA students entering high school, IDEA students tend to under-perform on the SAT and college performance. Indeed, even when compared to high schools in the same labor market, IDEA students substantially underperform in college. This entry simply updates the previous post with a new cohort of students. Sadly, despite the rhetoric from IDEA, Tom Torkelson, and the US Department of Education, the college preparedness of IDEA schools has been moving in the wrong direction. *** Some will argue that I am simply anti-charter. I actually think the original idea of charters had great potential to move away from some of the traditional modes of teaching and learning and build more authentic models that truly engaged students in the learning process and engaged them in work within the community while learning academics. Unfortunately, most charters seem to be test-prep institutions that create unimaginative, compliant, unquestioning graduates who have a difficult time thinking critically. I have recently agreed to be the lead evaluator of a proposed charter schools that will address the holistic education needs of students. If I was anti-charter, I would have never signed onto that deal. As AISD considers whether to continue with IDEA charters, here is some real research based on data for the Austin community to consider about IDEA and college readiness.